You got an e-mail? From whom? This actually looks legit. Can confirm. Also got email. Got this as well from Blizz, this is legit. 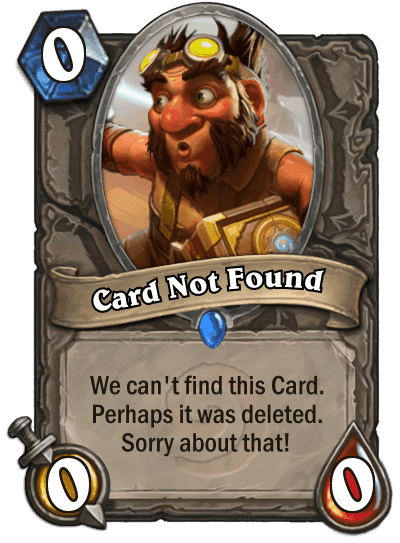 This is interesting, this guy should have rush from Dr Boom, potentially 2 big rush minions? You need a proper card reveal announcement dude. You now, the card with its art, text and other things. And yeah I got what I wanted lol. Thanks. As you beat me to it by a few seconds, I guess I'll just take your thread for myself! Mine is an evil laugh! Aמnther one with "copy a big minion" card the question is how many cards you can actually play that cost too much(?) you can't play low cost minions in such deck.. I guess it's possible and we saw a few big minions you would like to play.. sadly no acolyte of pain in such deck..
and sadly such deck is very expensive dust wise... you need the boomship, this card and at least 3 other legendaries (Which are normally the big impact high cost cards) so.. damn this deck will be wallet warrior all over again. Really confused by this one. It's a big dude card, but it's also has bad synergy with the other big dude cards because if you pull it it's just a body with no taunt, rush, or other immediate impact. Cool art though. Fel Reaver <> The Boom Reaver. Another support for wild Recruit Warrior, however recruiting this would be really bad. Look, I have to be an idiot or something to state, that control warrior won;t see play in standard. It will, but it's reliant on many cheap minions (the 5 mana 3/5, zilliax, the new Omega mech, the 3 mana 3/2 execute). I just don't see a standard deck, which will be based on spells, the hero card and expensive minions. That would be too risky imho. If you play a minion light deck you are definitely playing Dr. Boom, Mad Genius so this could have rush. That's my take on it. It's essentially another removal spell on a good body. Double removal if you have Boom up. But how big does the minion this pulls really need to be? A 5/5 is probably fine for this card (But not the 10 mana spell, making this a lot more usefull). It's a first try to build such a deck and actually it seems solid Warrior has enough removal to really get there and there are some really good minions you could play .. I am not sure if zilliax should be included as well I mean 10 mana double zilliax is it good? Vargoth is actually really good since if you summon 2 copies of him at the end of your turn you cast the 10 mana spell twice more! the value!